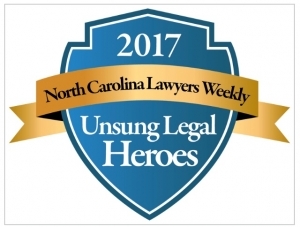 The Noble Law Firm’s Director of Marketin g and Client Services Josh Kalish has been named to North Carolina Lawyers Weekly’s Class of 2017 of “Unsung Legal Heroes,” a recognition program honoring law firm staffers across the state for their dedication to duty. Josh was recognized as a Legal Marketing Professional honoree, one of eight professional categories the new program celebrates. As part of a special section for the magazine’s December special issue, North Carolina Lawyers Weekly’s Tiara Benfield spoke with Josh to learn more about his career and professional accomplishments. Asked why he chose to pursue a career in the legal field, Josh shared he finds it very rewarding to help clients navigate legal processes to resolve workplace issues. “In my opinion, employment law offers a nice balance of solving client issues in the workplace with both creative business solutions and legal remedies” he added. With the exponential increase of calls into the Firm by victims of sexual harassment and assault, in large part due to #metoo and #timesup movements, it is very rewarding to be able to offer top-tier legal representation and counsel to those in need. Reflecting on his work with the Noble Law Firm, Josh points to the “Client Journey Blueprint” as one of his proudest professional accomplishments. “We know that some people dread having to deal with a law firm, particularly when other things in their life are not going well,” he explained. Josh interviewed several clients, past and current, to learn from their perspective of working with the Firm throughout the lifecycle of their legal matter, identifying the key “moments” in these interactions that defined their experience. Armed with this first-hand knowledge, Josh created unique internal service level agreements that set the standard for how the Firm and its attorneys engage with and support clients. “Our reward is that our clients tell us that working with us doesn’t feel like a ‘typical’ law firm,” he added. Josh joined The Noble Law Firm full-time in 2015, after several years in an advisory capacity, to lead the development of Digital Capabilities. He is currently Director of Marketing and Client Services where he leads the outreach efforts to promote the Firm’s growing legal services offerings. 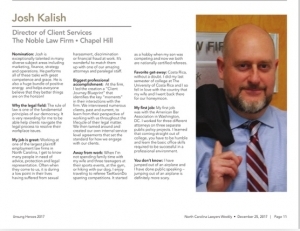 Look for Josh’s full responses in North Carolina Lawyers Weekly’s special issue on December 25, 2017. This entry was posted in Noble News and tagged #metoo, #NCLawyers Weekly, #SexualHarassment, #TheNobleLaw, #timesup. Bookmark the permalink.